This set of Cyber Security Questions and Answers for Experienced people focuses on “Ports and Its Types – 2”. 1. Which of the following is the port number for SMTP service? Explanation: Port number 25 is the logical port number for Simple Mail Transfer Protocol (SMTP) service. SMTP is an Internet standard protocol for email transmission. 2. Which of the following are the port numbers for IPSec service? Explanation: Port numbers 50 and 51 are the logical port numbers for IPSec service. IPSec is a standard protocols suite used among 2 communication points that help in providing data authentication, confidentiality, and integrity. 3. Which of the following are the port numbers for DHCP? Explanation: Port numbers 67 and 68 are the logical port numbers for Dynamic Host Configuration Protocol (DHCP) service. It helps in providing Internet Protocol (IP) host automatically along with related configuration information like subnet mask and default gateway. 4. Which of the following is the port number for TFTP service? Explanation: Port number 69 is the logical port number for Trivial File Transfer Protocol (TFTP) service. It is an internet software utility protocol used for transferring files. 5. Port 80 handles unencrypted web traffic. Explanation: Ports are assigned to different services for identification of which port is sending traffic over the network. Port 80 is used by the popular HTTP (Hyper Text Transfer Protocol) that handles unencrypted web traffic. 6. Why it is important to know which service is using which port number? Explanation: If a security analyst or ethical hacker knows which port is open and through which port data is going, he/she will be able to know which data is going in encrypted form and which one is not. Also, it helps in securing a system by closing the logical ports so that hackers cannot gain access through them. 7. Which of the following is the port number for SFTP service? Explanation: Port number 22 is both used as the logical port for Secure File Transfer Protocol (SFTP) as well as Secure Shell (SSH) service. This is because SFTP also uses SSH for encryption. 8. Which of the following is the port number for HTTP? Explanation: Port number 80 is the logical port number for the popular Hyper-Text Transfer Protocol (HTTP) service. This protocol defines how messages are formatted and transmitted over unencrypted traffic. 9. TACACS+ uses TCP port 49. Explanation: Terminal Access Controller Access-Control System (TACACS) is used for handling remote authentication and associated services. TACACS+ was developed by Cisco Systems in the year 1993. 10. Which of the following is the port number for Kerberos? Explanation: Port number 88 is the logical port number for Kerberos service. It is a computer network authentication protocol that works on a non-secure network to prove the identity. 11. Which of the following is the port number for POP3? Explanation: Port number 110 is the logical port number for Post Office Protocol-3 service. This protocol periodically checks our mail-box for synchronizing our latest emails with that of the server. 12. Which of the following is the port number for SNMP? Explanation: Port number 161 is the logical port number for Simple Network Management Protocol (SNMP) service. It’s an application layer protocol that helps in managing and monitoring our network devices. 13. Which of the following is the port number for SNMP – Trap? Explanation: Port number 161 is the logical port number for Simple Network Management Protocol (SNMP) – Trap service, where Trap is used for services like prompting with alerts if the device that is using SNMP-trap is overheated. 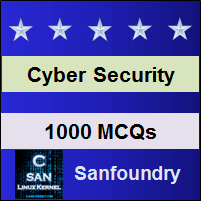 To practice all areas of Cyber Security for Experienced people, here is complete set of 1000+ Multiple Choice Questions and Answers.